The Wheel of Time book series is a legend in the fantasy genre. Author Robert Jordan has ammassed a cult following over the years of die-hard, dedicated fans. 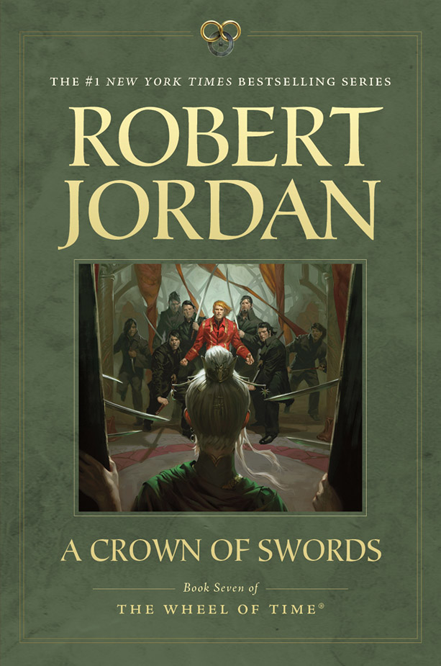 We are proud that for the new book coming out A Crown of Swords, our own Tyler Jacobson created a beautiful cover. When it came time to print the trade paperback editions, editor Harriet McDougal asked if we could depict the scene where Cadsuane meets Rand for the first time. It’s a great moment in the book but I feared it might be a difficult one to depict, being a cinematically quiet test of wills. Luckily, artist Tyler Jacobsonpulled it off with flying colors. I met Tyler a few years ago when I went to a portfolio review at the University of the Arts in San Fransisco and have been watching his career ever since. I needed someone that understood the fantasy aesthetic and could handle a crowd scene—Tyler’s name came to mind pretty quickly. Not only did he manage to get all those characters into a small space, he was able to capture the sense of tension embedded in the scene. Not an easy task in a still image. Below you can see his paintng process step-by step. I knew I had gone to the right artist as soon as I saw these sketces. What seemed to me to be a compositional nightmare was clearly not a problem for him. The first one got a good amount of movement in a static scene, and I like that Cadsuane is a pillar of calm and unperturbed by the crowd, but it was a bit more expected than the other two compositions. I also really liked the third sketch, it was a great way to show Cadsuane's strength and calm even while faced with a room full of Asha’man on guard. The trouble was, Asha'man didn't use spears and I didn’t think the swords would work in their place. There was also a height issue between Rand and Cadsuane. The middle seemed just right. She enters a room full of pent-up agression with strength and poise, completely confident, as befits her status as a near-legendary Aes Sedai. The final drawing. Note this is before we swapped the spears for swords. And here you can follow his painting style through a number of steps. It is interesting that, although he is painting digitally, he following a very traditional technique by blocking in all the values first and then slowly introducing color.